Nothing on the seashore is ever still; the waves break, the winds blow, and most importantly the tide goes in and out every day. It is due to these factors that the rocky shore is one of the most diverse and fascinating habitats on our coastlines, as the creatures and plants that live there must be hardy survivors. 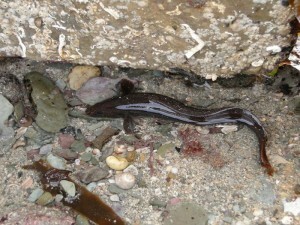 The reef off Hannafore Point, sheltered from the prevailing weather by Looe Island, is particularly rich in intertidal species. The rocks are covered in seaweeds with many crevices and rockpools providing shelter for an abundance of crabs, anemones, sponges, sea squirts and molluscs of all kinds. If the tide is low enough you may even be lucky enough to find the huge mermaid’s purses of the Nursehound shark attached to the weed, or the occasional scallop sitting on the sandy bottom between rocky gullies. Where the reefs extend into deeper water, they support dense kelp forests. The rocky shore is made up of different zones, which in turn play home to a variety different plants and animals depending on how well they can tolerate the exposure to the air, the crashing waves, or even where their best food source is. Creatures that need to be underwater for longer periods of time live at the bottom zone, a zone which is only uncovered for a small space of time with the low tide. At the other end of the scale are the creatures that can tolerate dry conditions and live at the top zone, where they are exposed for hours before the tide comes back in. Lichens, limpets and periwinkles can all endure the bright sunlight, dehydration and rapid changes in temperature. The sheltered rocky shore is made up of many micro habitats, such as overhangs, crevices, boulders, and of course the popular rockpools. 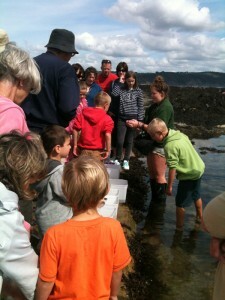 Rockpools are teeming with all kinds of life which change with the seasons. Like on land, plants die off and some creatures even migrate to deeper waters in the winter months. 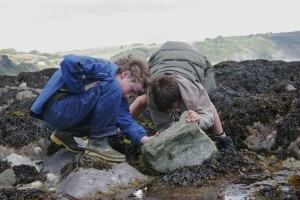 Often when rockpooling, it is the starfish, found clinging under rock ledges or in tiny crevices, that is the main attraction and the highlight of a trip. Related to brittle stars, urchins and sea cucumbers, they come in many different sizes and colours, and generally have five arms although some species here in Britain have seven such as the sunstar. But what makes the rocky shore even more fantastic apart from these amazing plants and animals? It is free to visit! In Cornwall we are incredibly lucky to have this diverse habitat on our doorstep which is often easily accessible for all ages and abilities. Looe must have some of the best rockpooling in the entire county, from East Looe beach rocks all the way along to Hannafore point in front of Looe Island. 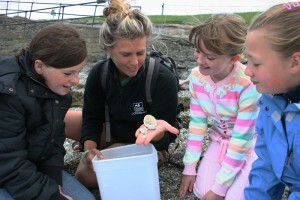 For information on when & where to go rockpooling, visit our Things To Do section for rockpooling.